Steven Gamble began playing the trombone as a grade-schooler in Phoenix, Arizona. After attending Arizona State University, he moved to Chicago where he was a founding member of the Chicago Chamber Brass. He was a member of that ensemble for ten years and his contributions included a large number of successful arrangements for brass quintet, many of which have been published. As a result of his association with CCB, Gamble has performed in nearly every state in the U.S. as well as in Europe. 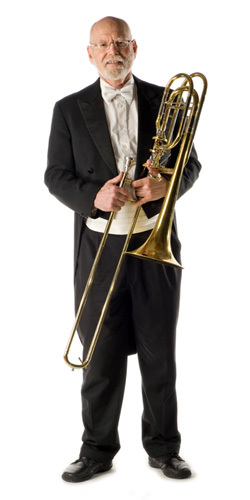 He has held positions in the Santa Fe Symphony Orchestra and the Arizona Opera Orchestra as bass trombonist and is currently Second Trombonist of the Tucson Symphony Orchestra and bass trombonist of the Tucson Pops Orchestra. Mr. Gamble can be heard on recordings for the Pro-Arte and Crystal labels. In addition to his performing career, Mr. Gamble has been involved extensively in education. He has appeared at many significant state and national music educator’s conventions across the U.S. as both clinician and performer and has held teaching positions at Elmhurst College (IL), Mesa Community College (AZ) and the University of New Mexico. Mr. Gamble is the founder of the Tucson Trombone Troupe, a summer program for young trombonists. My older siblings’ grade school band concert which included some very obnoxious warming up by the trombone section. Music of the Romantics and Neo-Romantics. But the old response ‘whatever I’m playing now’ is also (mostly) true. Read, bike, swim, watch entirely too much TV. Where did you go to school? Did? What are your favorite places in Tucson?